Allergic rhinitis is an allergic inflammation of the nasal airways. 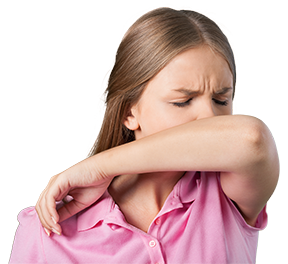 It occurs when an allergen, such as pollen, dust or animal dander (particles of shed skin and hair) is inhaled by an individual with a sensitized immune system. In such individuals, the allergen triggers the production of the antibody immunoglobulin E (IgE), which binds to mast cells and basophils containing histamine. When caused by pollens of any plants, it is called "pollinosis". Sinusitis is inflammation of the paranasal sinuses, which may be due to infection, allergy, or autoimmune issues. Most cases are due to a viral infection. Nasal polyps are polypoidal masses arising mainly from the mucous membranes of the nose and paranasal sinuses. They are overgrowths of the mucosa that frequently accompany allergic rhinitis. They are freely movable and nontende. Generally, nasal polyps is harmless. However, it may cause breathing difficulties and affects the sense of smell if nasal polyps is too large in size or too many in quantities.